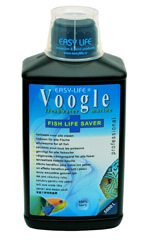 Voogle creates excellent water conditions for fish and other animals in freshwater aquariums. Every fish has a natural immune system against pathogens. Transportation, dirty water or a high number of pathogens in the water cause a lot of stress. Stress costs a great deal of energy and has a negative effect on the immune system. The mucous skin, gills and fins, in particular, become more sensitive to diseases, such as white spot, fungi and other types of infection. Weekly use of Voogle ensures that fish remain optimally protected in a natural way and the dangers resulting from pathogens are greatly reduced. Voogle has no harmful effect on fish, shrimps, lobsters, molluscs, plants or the biofilter. Voogle has no effect on the important water parameters and does not cause resistance. Voogle mostly consists of plant extracts and supporting vitamins and minerals. Voogle breaks down naturally, so that it is not necessary to change the water after using the product. *** Voogle is extremely safe to use and multiple doses can be added in one go if the situation requires. The course of treatment can also be extended without any problems.